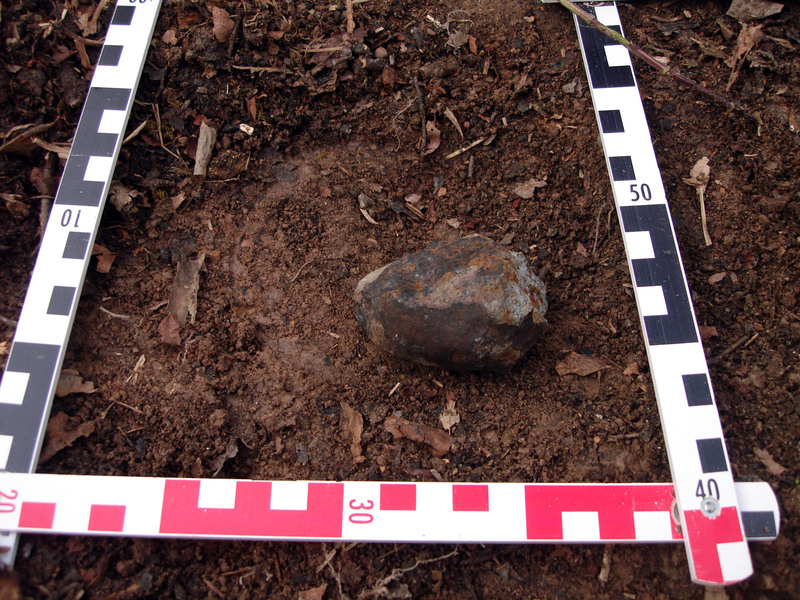 At 11.40 a.m. on 1 September 2018 the team of Łukasz Smuła, Magdalena Skirzewska and Thomas Kurtz found 19 fragments weighing between 8.62 and 0.18 grams of a meteorite fragment on a forest path in the Mührig state forest within the communal district of Renchen, Landkreis (district) Ortenau, Baden-Württemberg, Germany. 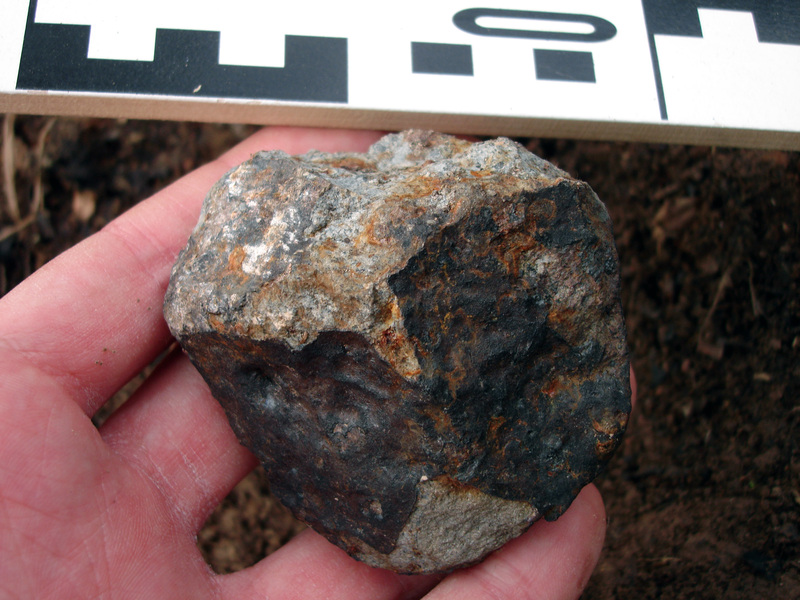 The meteorite, most likely one of the fragments which broke off the 955-gram mass Renchen-2, fragmented on impact on the gravel path and broke into at least 19 pieces and several smaller sub-0.1-gram fragments. 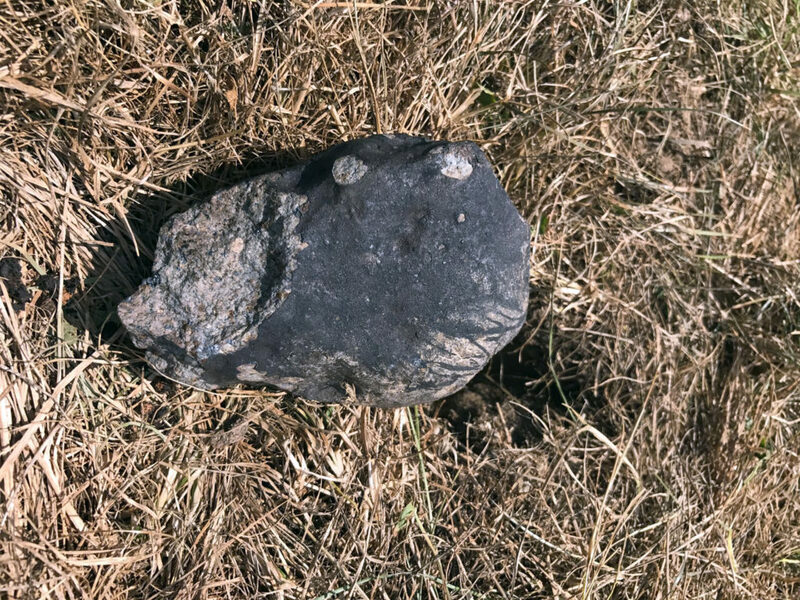 Four larger fragments were found along a more than 317 centimeter long line crossing the path from southwest (~226°) to northeast. The distances between the find locations of the fragments are: R3B&C ← >132cm → R3TK1 ← ~82cm → R3A ← ~102.5cm → R3TK2). 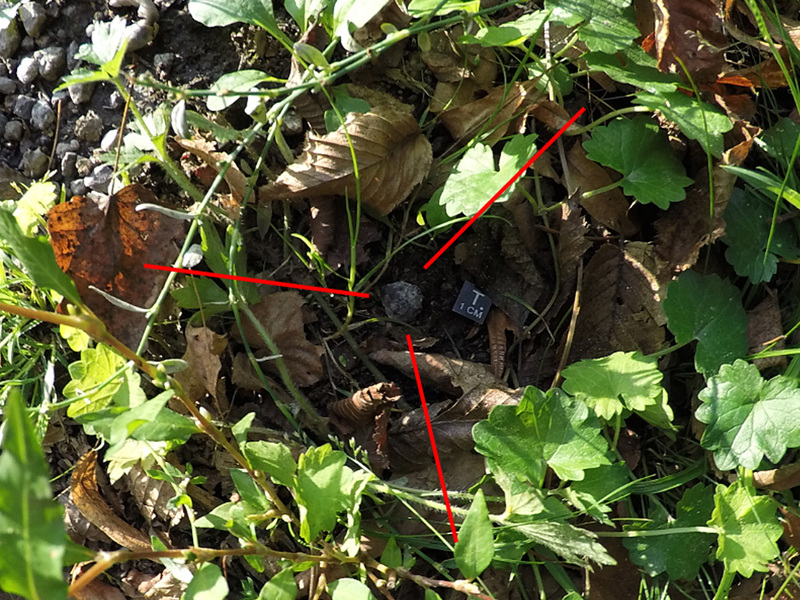 The three fragments R3B, R3C and R3TK2 were found in the grass next to the path and close to the respective crosses on the path. 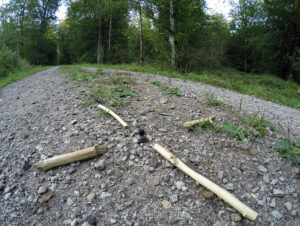 Smuła and Skirzewska had been searching the area dedicatedly and intensively for more than a week when they teamed up with T. Kurtz on 1 September. 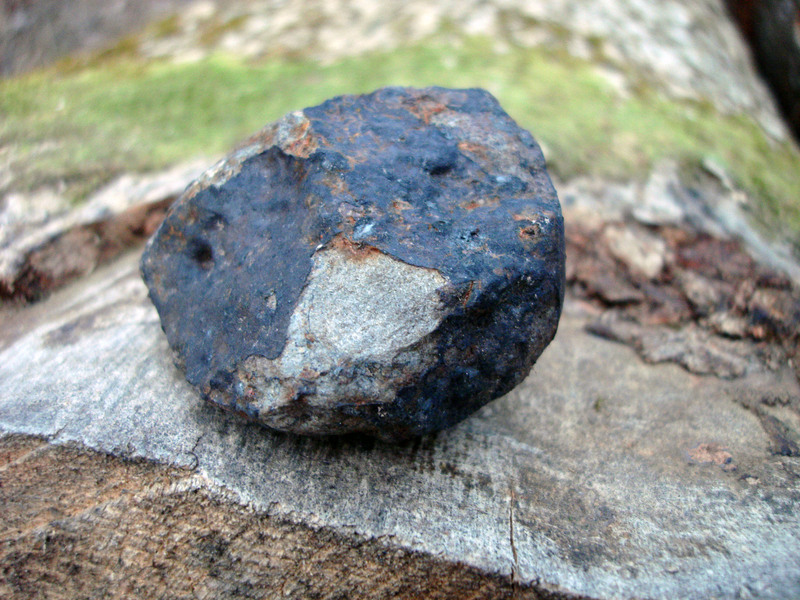 The 8.62-gram fragment was found by Łukasz Smuła rather by accident while coming back from the dense undergrowth near a tree plantation southwest of the path where he had looked for meteorites in the high grass with a metal detector. The meteorite fragment stood out from the light-coloured compacted gravel of the forest path because of its fusion crusted surface area pointing upwards. 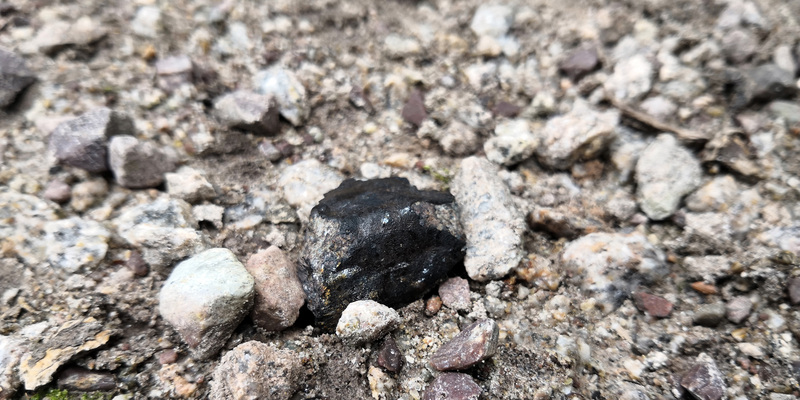 Immediately after the team started looking for more fragments of the meteorite which most likely had shattered on impact on the compacted gravel of the forest path. 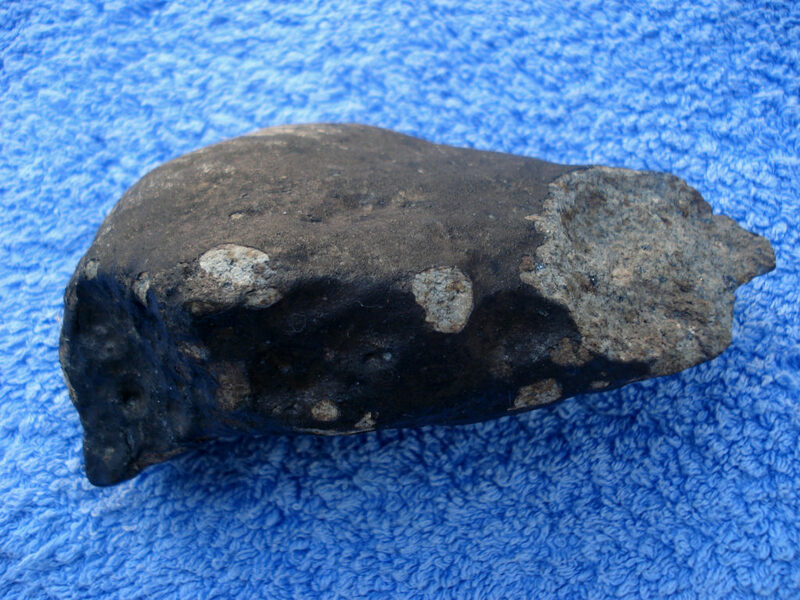 Four larger meteorite fragments were found on and along the path. 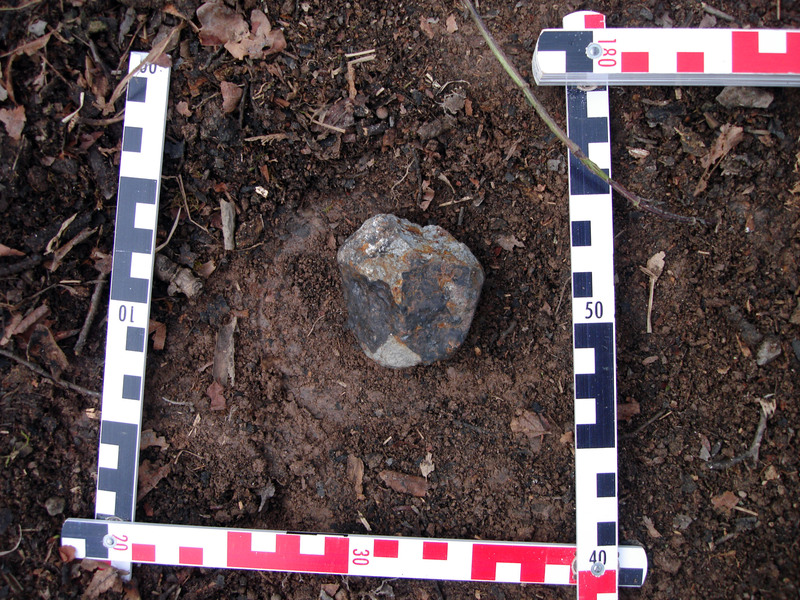 On 3 September another fragment was found at the edge of the path about three meters north-northwest from the fall location. 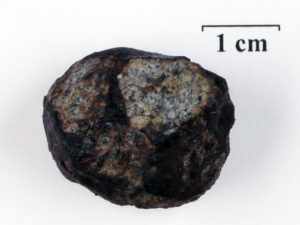 On 12 September two fragments of Smuła and Skirzewska’s meteorite (Renchen 3c and 3r5) weighing 1.298 and 0.054 grams were sent to Prof Dr Addi Bischoff and PhD student Markus Patzek at the Institut für Planetologie at the Westfälische Wilhelms-Universität in Münster for classification. 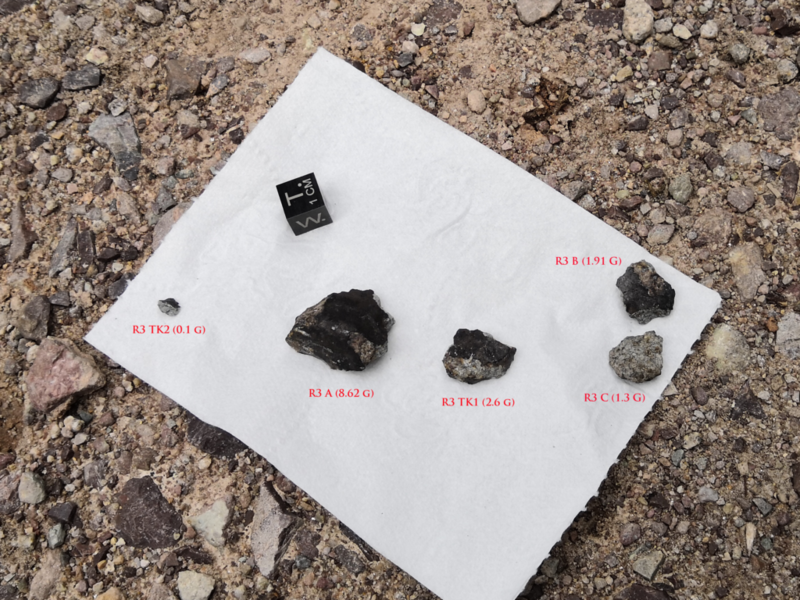 The classification result communicated by Dr Bischoff on 21 September indicate that Renchen is an L-chondrite breccia (L5-6, S4, W0). On 24 December RENCHEN was officially registered in the Meteoritical Bulletin Database. 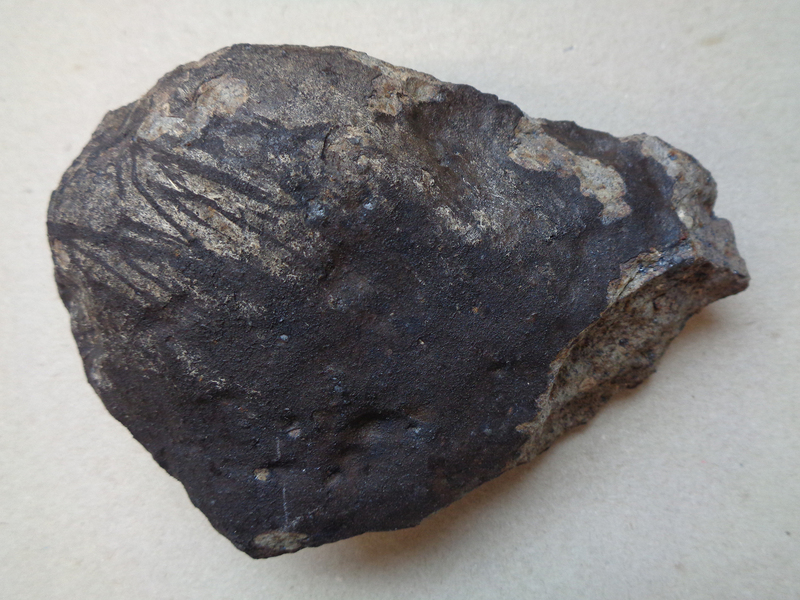 In the evening of 23 February 2019 we received the first information by Thomas Kurtz of the find of a new Renchen meteorite which had been found by himself and Dr Oliver Sachs in the afternoon of that day. 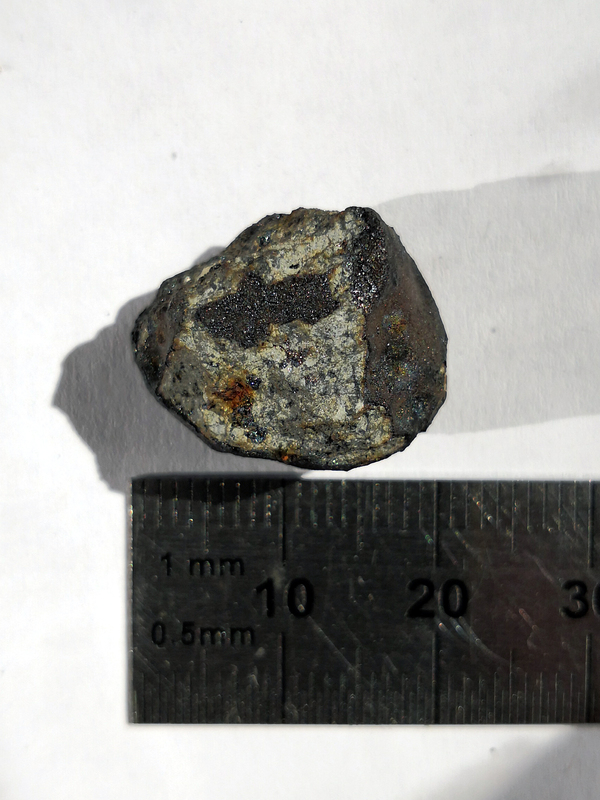 Since Thomas Kurtz had joined Łukasz Smuła and Magdalena Skirzewska to search for Renchen meteorites on 1 September 2018 he had assumed that there had to be another bigger fragment of Renchen-3, estimated to weigh about 70 grams. It was geologist Dr Oliver Sachs who motivated Kurtz to search the fall location of Renchen-3 again. 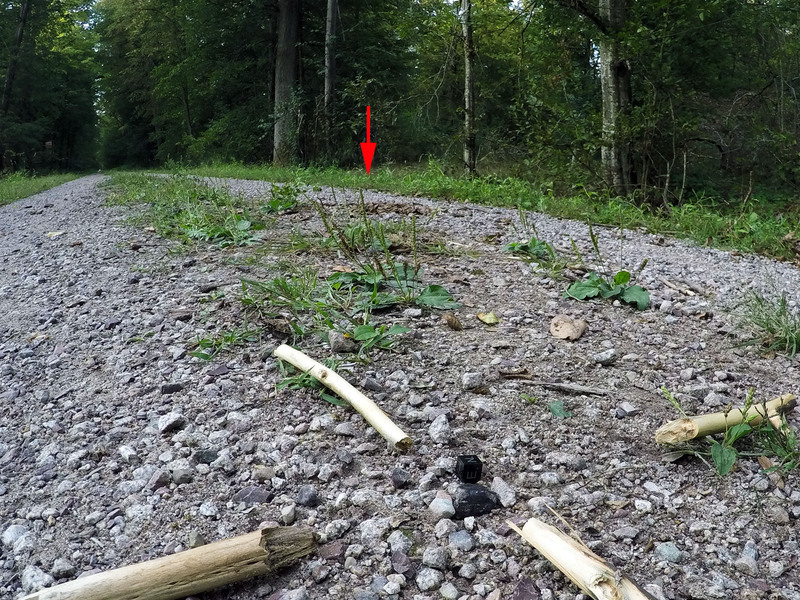 Sachs had already searched the strewn field in August 2018. 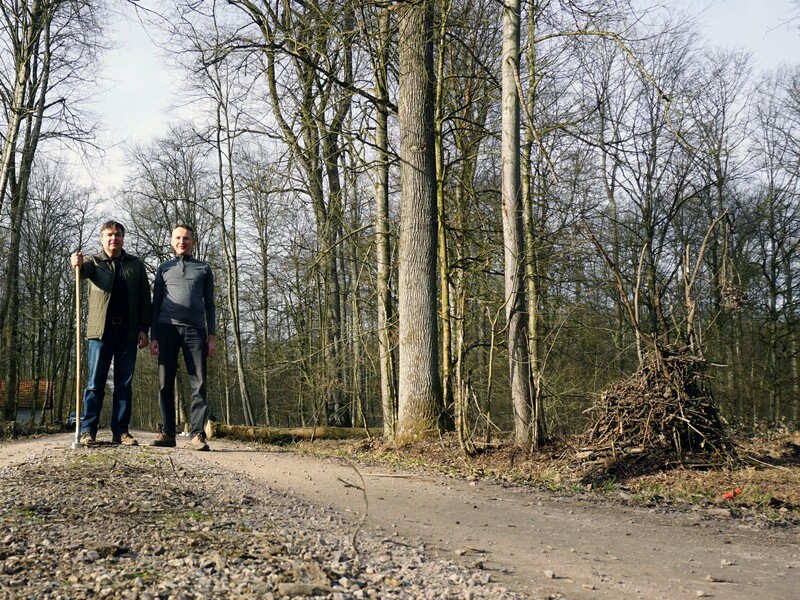 Sachs and Kurtz are the chairmen of the friends’ association of the RiesKraterMuseum in Nördlingen and during one of their meetings Sachs had the idea to search for the sticks which had been used to mark the locations of the Renchen-3 meteorite fragments on the forest path in order to collect them together with some gravel of the path for a planned reenactment of the find situation of the Renchen-3 fragments. 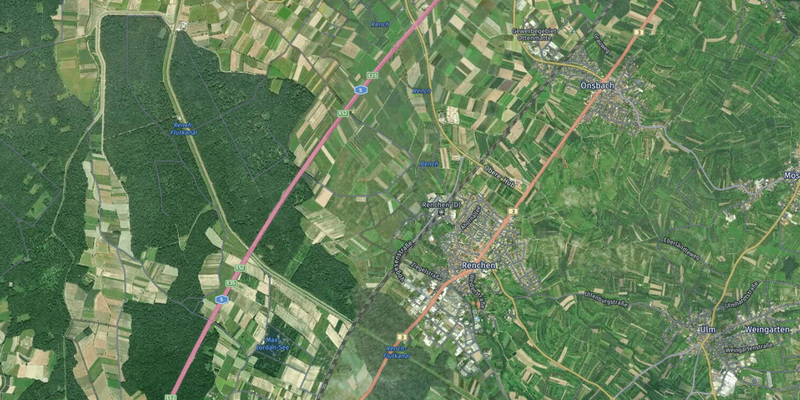 Because of bad weather the search had to be postponed several times. 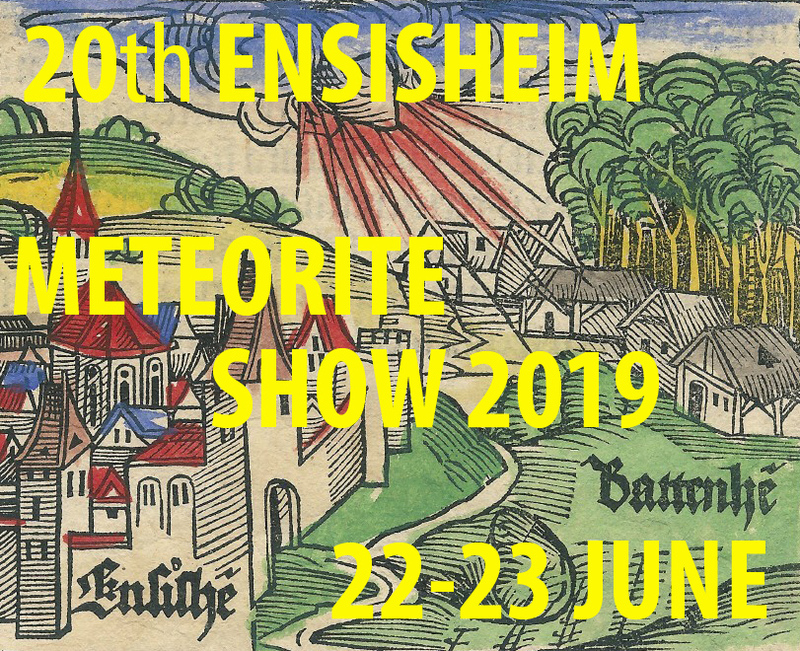 When they learned that Dieter Heinlein was about to deliver a speech on the Renchen meteorite fall in the Stuttgart Planetarium on 22 February 2019 Kurtz and Sachs decided to go there and then go to Renchen again the following Saturday. 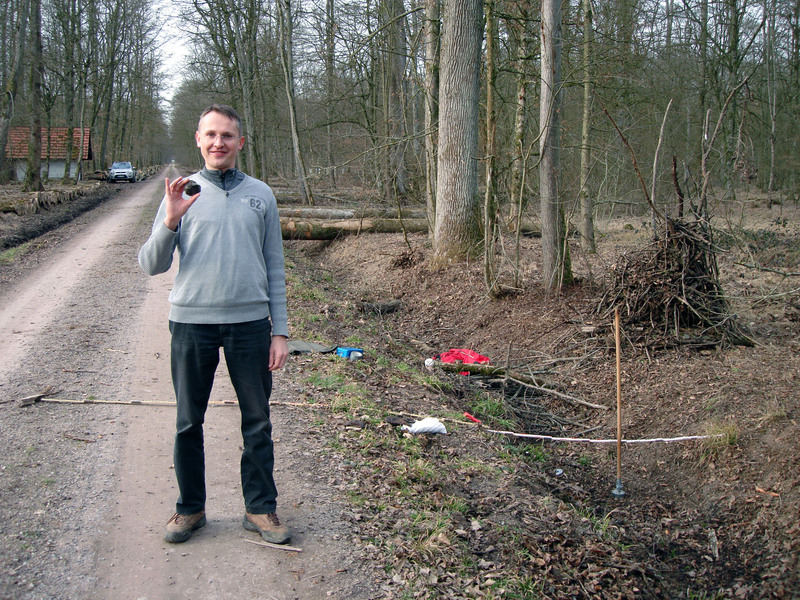 In the afternoon of 23 February 2019 after having searched the eastern ditch with his magnet stick for about one hour Kurtz decided that there were too many branches and leaves making the search inside the ditch ineffective. 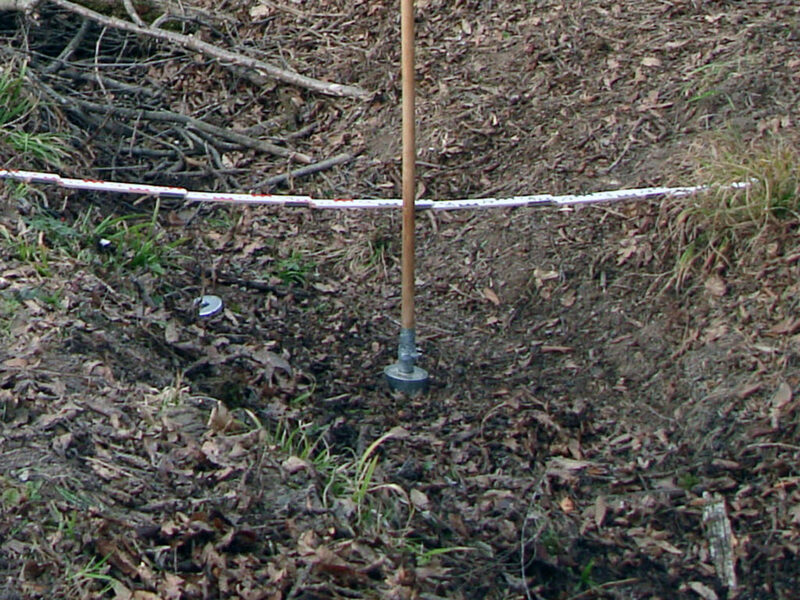 He then spent about four hours removing those branches, twigs and leaves, piling them up and ‘scanning’ the ground with a magnet repeatedly while Sachs was searching an area 15 to 20 meters away. 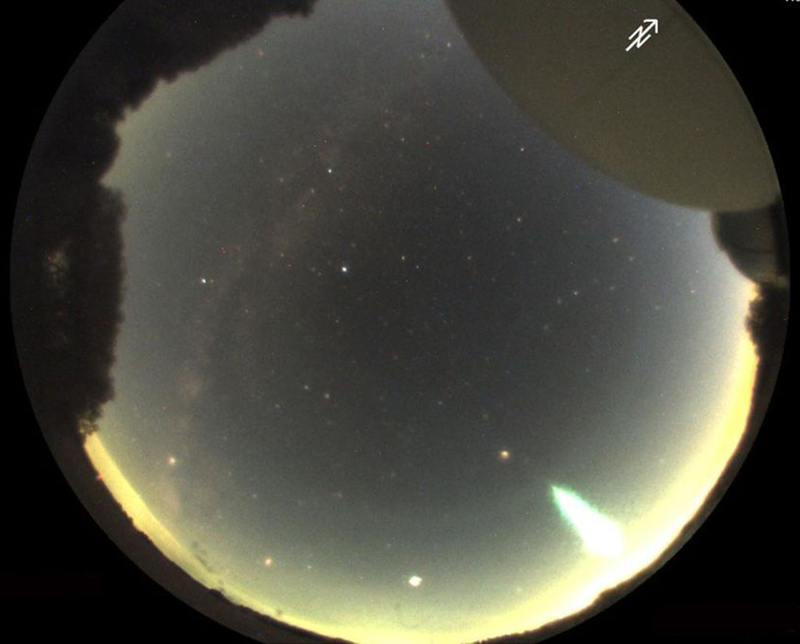 Suddenly at around 4 p.m. Kurtz hit something hard with his left shoe. 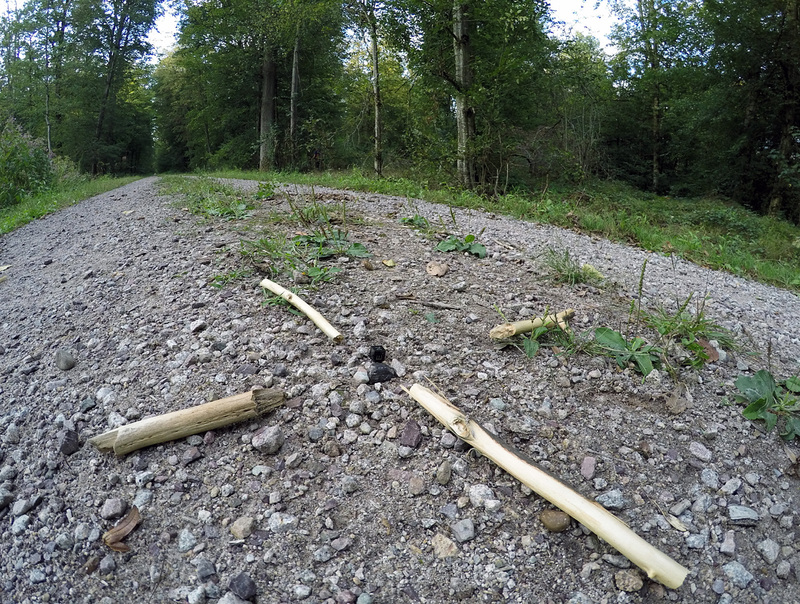 He reached into the 20-cm layer of leaves and twigs still covering the ground and grabbed the hard object he had just hit. 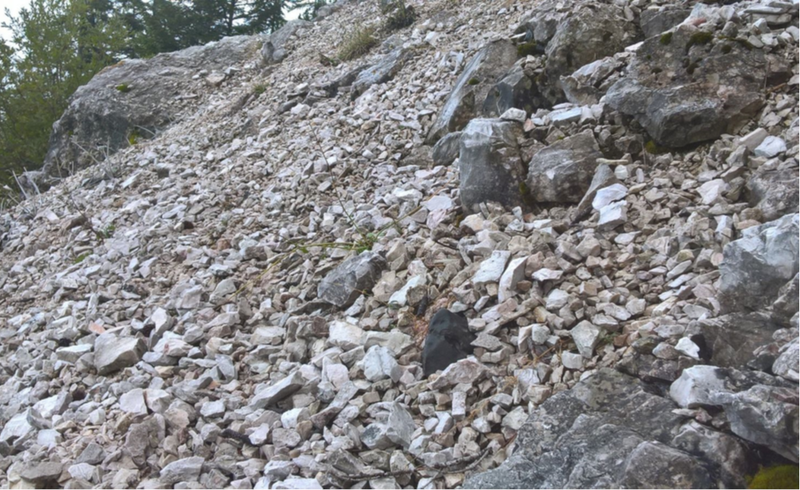 While picking it up he was immediately aware that he had found the Renchen-3 main mass [Renchen-6], almost 228 days after its fall, inside the eastern ditch about four meters away from the centre of the path. 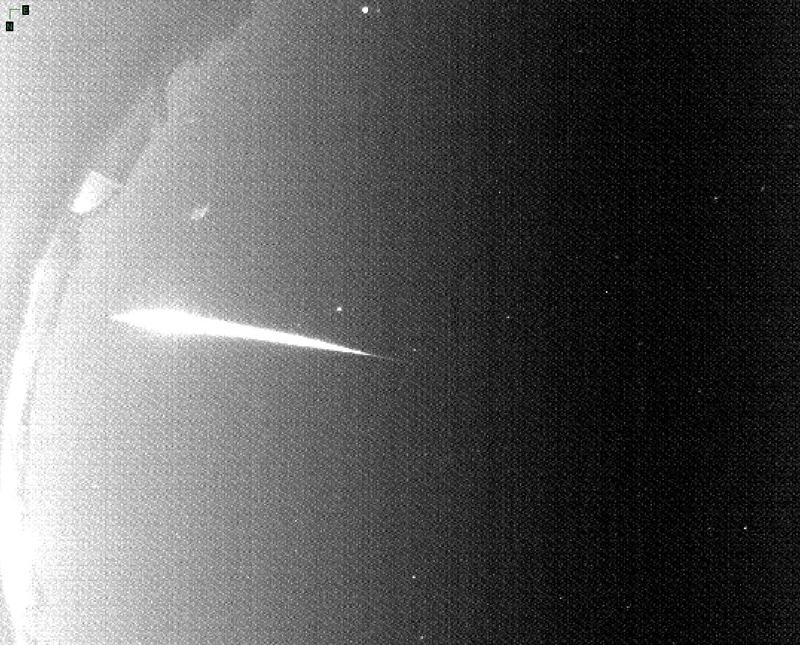 Thanks to the finder’s awareness the meteorite was fortunately not exposed to the artificial magnetic field of a permanent magnet. 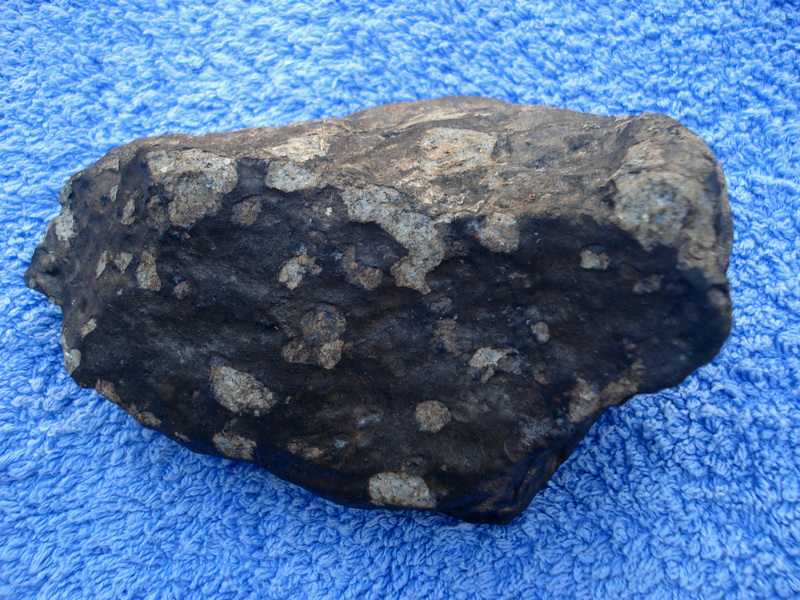 Kurtz needed to tell Sachs twice that he had found a meteorite before he could believe it and then rushed to join Kurtz at the find location. 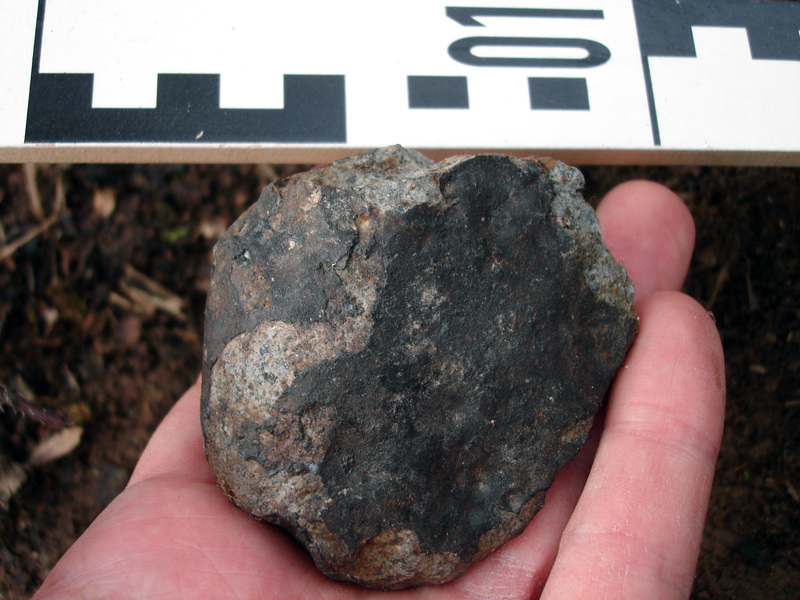 They noticed that both the 8.6-gram fragment of Renchen-3 (found 175 days before) and the new specimen had the same light greyish scratches on the fusion crust which resulted from the impact of the meteorite on the surface of the gravel path. 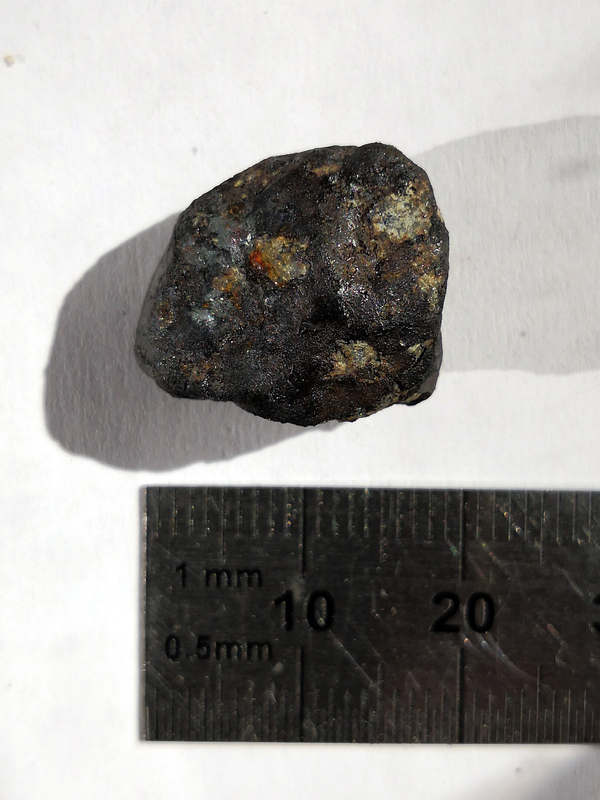 Later Oliver Sachs searched the find location of the Renchen-3 main mass again with a strong magnet and found a crustal fragment (9.2 x 5.5 x 1.9 mm) of 73 mg. With this new find the total weight of Renchen-3 is 248.8 grams. 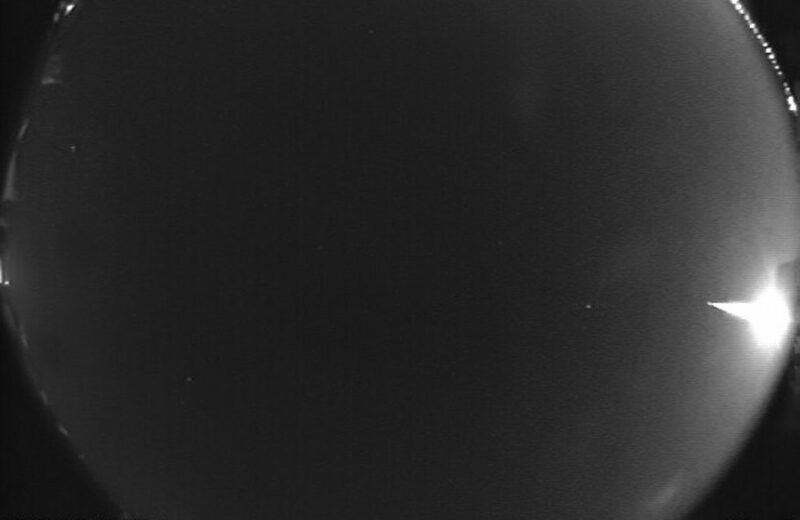 months since the fall. 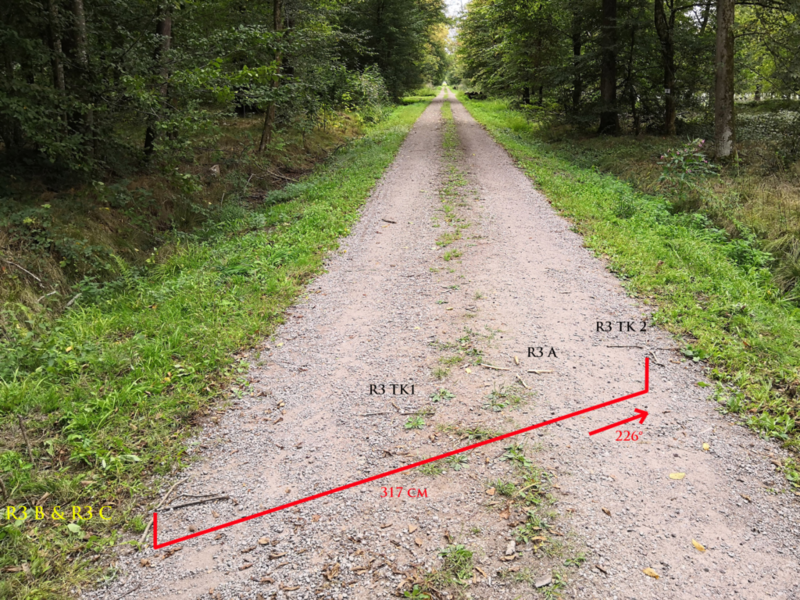 Fortunately the ground in the ditch and the area around had equally not been physically modified by forestry workers as it had been done in and around the western ditch of the forest path. 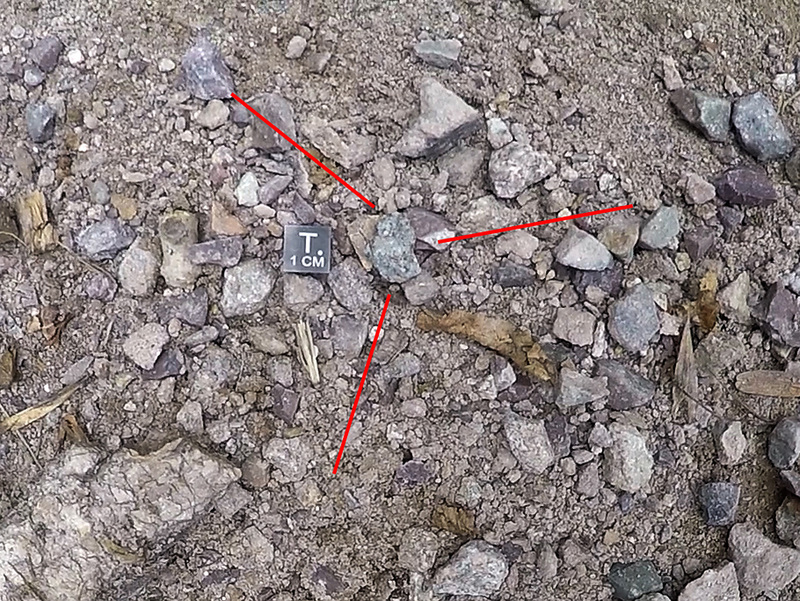 This orientation mistake and a reliance on memory rather than on photographic documentation had most likely made the find of the Renchen-3 main mass [Renchen-6] possible in the end. 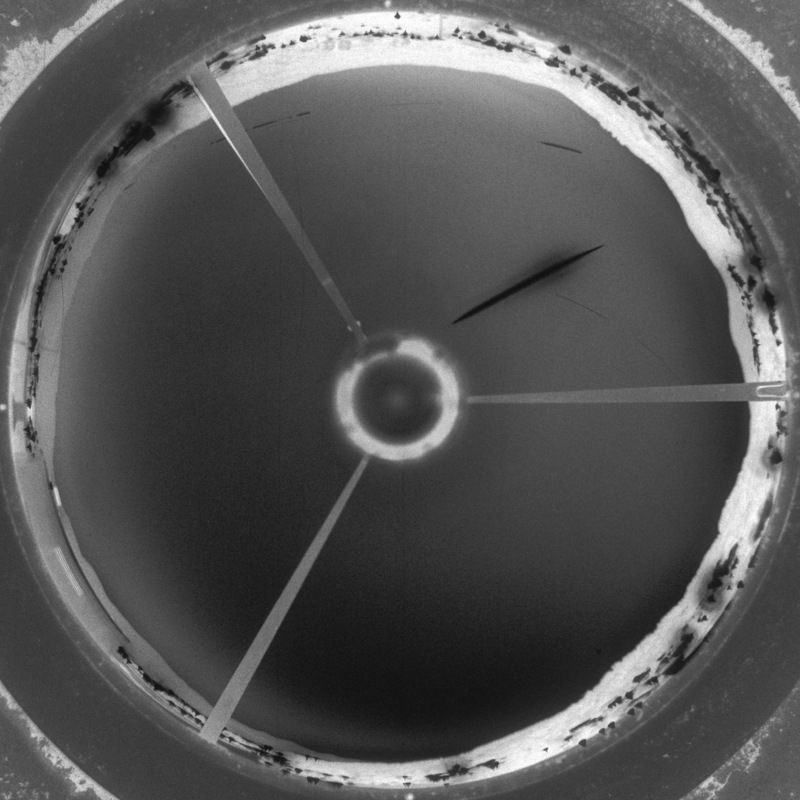 To determine the terrestrial age of the Renchen-3 main mass [Renchen-6] it was brought to Max Planck Institute for Nuclear Physics in Heidelberg for an analysis of short-lived radionuclides within the MPI’s germanium gamma spectrometer GIOVE (Germanium Inner Outer VEto) by Janina Hakenmüller. 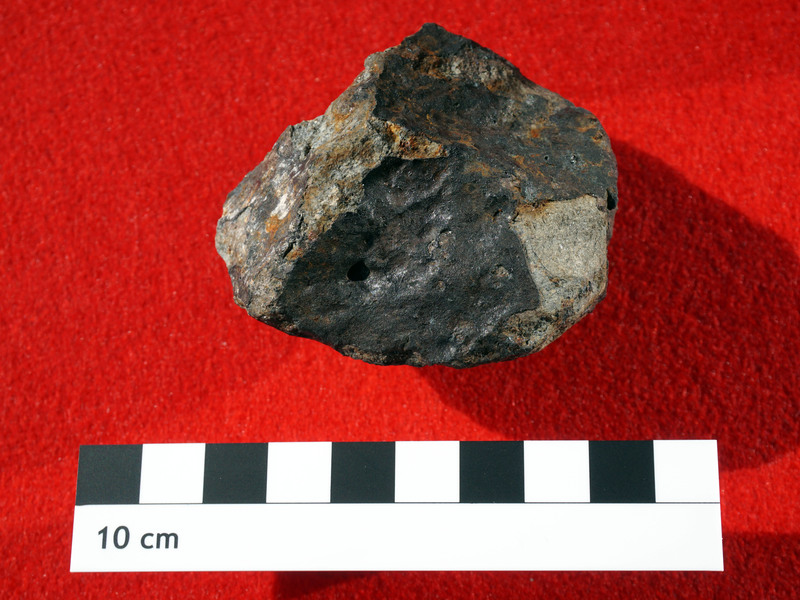 The meteorite was delivered to the MPI during the first week of March 2019. 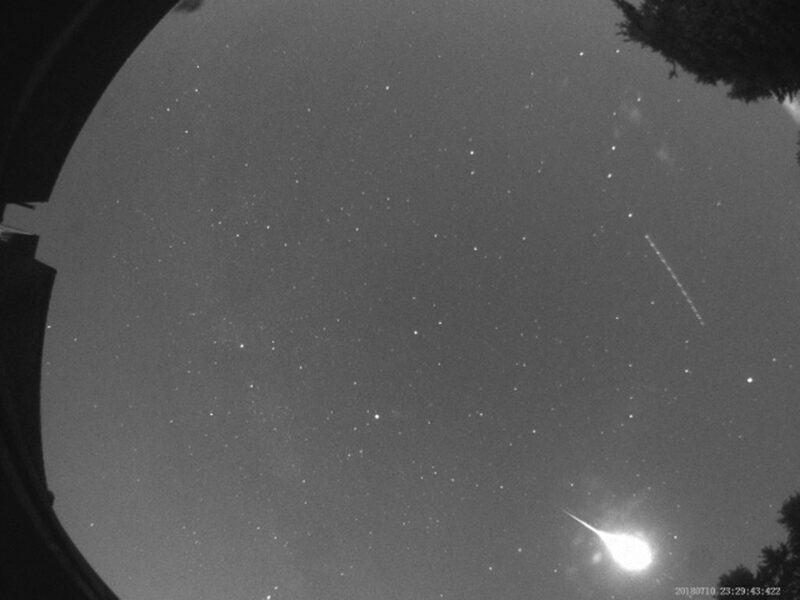 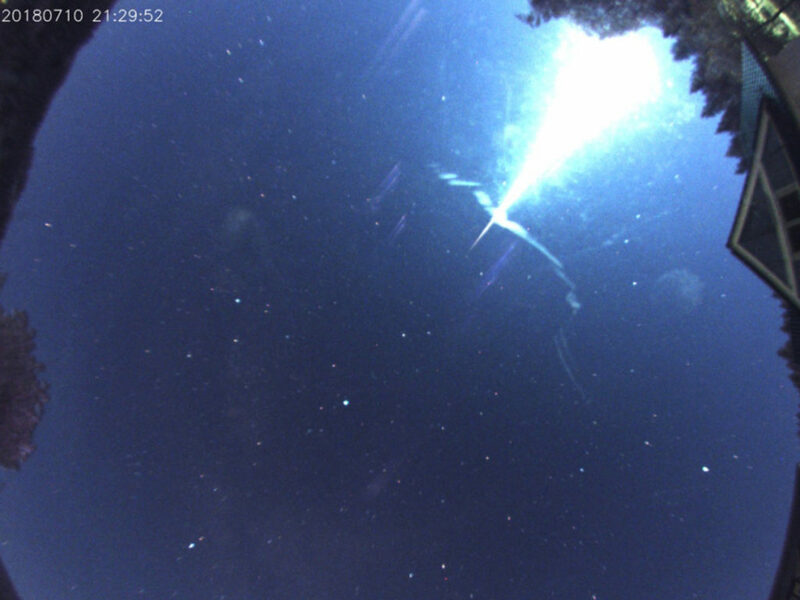 The analysis procedure took about three weeks and the meteorite was kept at the MPI until 5 April. 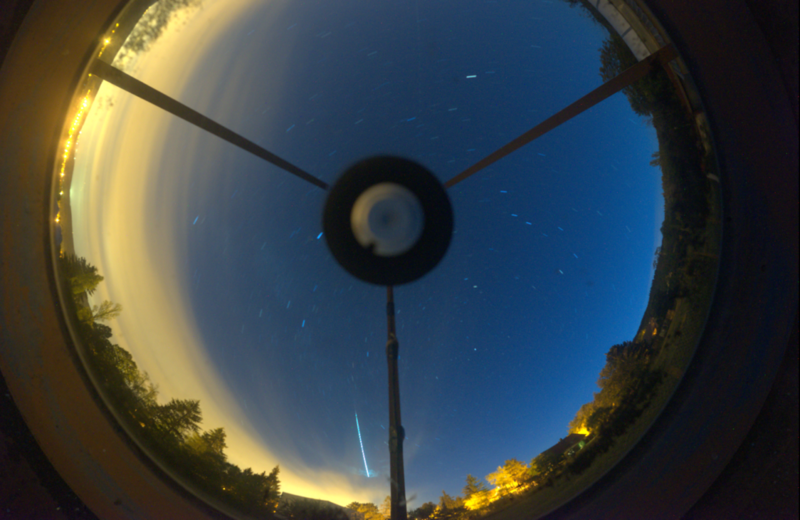 Then Dr Karl Wimmer measured the magnetic susceptibilty with an SM30 meter. 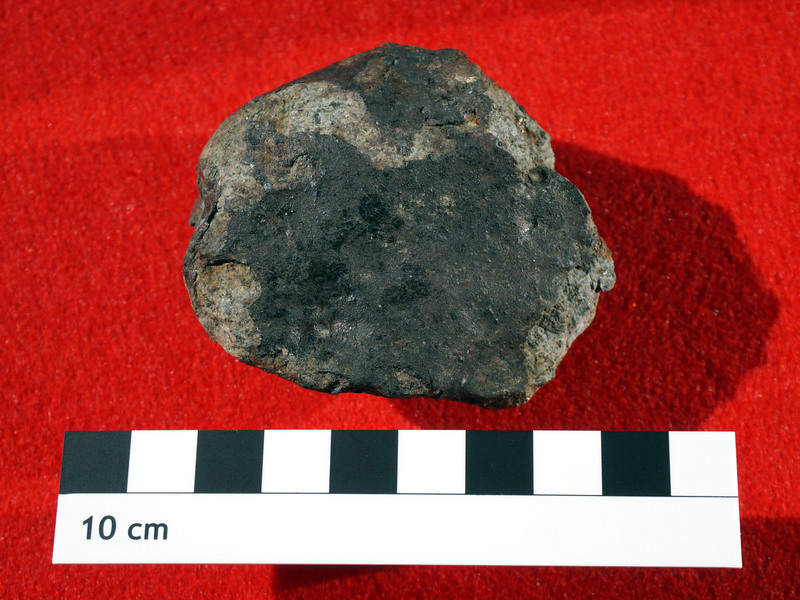 On 7 April the meteorite was given to Dieter Heinlein for density measurements.